I am notorious for creating brilliant ideas that I want to do in class tomorrow. Not a great strategy unless money and sleep-deprivation are no object. I remember a time while preparing for a lesson on ‘questioning’, I wanted to make laminated cards on rings that were color coded and had leveled question-starter-stems on them. Of course, our laminating machine at school was broken (as was the case frequently), and I wanted to use the cards for a lesson the following day. I had put time and effort into creating the cards and my options were, (a) let the students use them without laminating (i.e. they would get ruined and I would have to redo them once the laminator was back up) or (b) take them to Kinkos to be laminated. Now for any teacher who has never paid her own money to get things laminated at Kinkos, you will have no idea just how excited I was to get these cards done. I was dead set on it – despite it costing me $98.34. Yup. That happened. I remember as soon as he told me the cost, my stomach sank. But I really wanted those pretty, laminated, fancy cards – and wouldn’t it make my students realized how much I loved them and cared about their education?! Maybe – but it still hurt financially for the entire rest of the month! And PS – we used those dang cards so much the kids knew all the questions by heart (not a bad side-effect). But with a little pre-planning, I could have saved myself a lot of money, that sinking feeling, a late night in Kinkos, and a lot of stress. Okay – so titling this post “how to plan ahead for a stress-free school year” is a little misleading – I admit it. 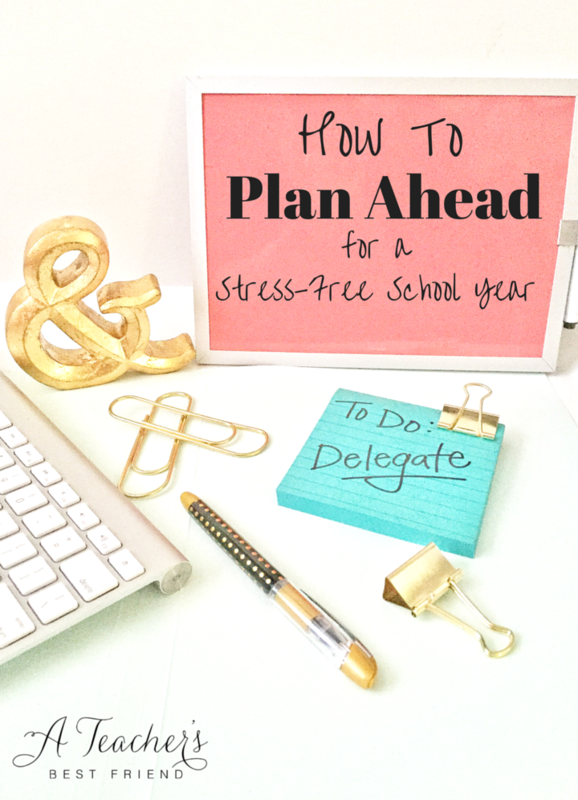 We all know that no school year is absolutely stress-FREE no matter how much planning ahead you do. But it can be less stressful and you can do more of the things that you want to do for your students with a little planning ahead. Planning ahead for your school year can help you to map out the big things that you want to make sure are done in order to fulfill your goals for your students. Planning ahead can also allow space and time for creativity, cost savings, and reduced anxiety. First, think about what you want for this school year: what field trips, projects, themed-units, speakers, celebrations, service projects and more do you want to build in to your curriculum? Then, think about what resources you will have to help you get those things done: what parent support, community resources, student help, grants, donations, and family/friend support can you leverage? Now, determine how you can plan to utilize your resources and time to ensure that those things you desire for your classroom this year get done! 2. Use a Calendar to Map out Those Events: Put the events and projects you listed in step one onto your school calendar or teacher planner. If you don’t have one, I really like The Day Designer or the teacher planners from A Modern Teacher. Peruse Teachers Pay Teachers for a huge selection as well. 3. Plan Ahead: List all the tasks that you need to do to accomplish that project. The point is – there were lots of steps to this experience – many of which I didn’t even list here. And for each of those steps that I took with students, there were often several steps that I took behind the scenes to prepare. But when surveyed at the end of the year, this activity was one of the students’ favorite and most impactful units. They understood the concepts and we put them to an authentic use in service to our community. Now, I will admit, I didn’t always follow my own advice (some of this I learned the hard way) and I (or my wonderfully supportive parents) would spend our own time, energy, and money to make the experiences happen for my students. Sometimes it was stressful. But I learned that there is an easier way! There are community members, donors, volunteers, and grants that can be utilized in support of this type of learning experience for students! But you have to plan ahead in order to take advantage of those. So think of one of the big things you want to do this year, and brainstorm all of the activities that will need to be done to make it happen. I suggest writing each task on separate sticky notes and placing on a large flat surface like a white-board or table so you can organize them into your calendar and determine which can be delegated. 4. Determine what Can be Delegated: Oftentimes we have parent volunteers, community helpers, student helpers, friends and family who would be more than willing to help (as long as they have enough time). For example, I used to make bags of “jobs” for parents to take home if they were willing to help. Or else, I had them sitting behind my desk if a student or community volunteer came in to my room for the day and had the chance to help me out for a bit. It took some time to set up the bags, but never took more time than doing the task itself. Here is an example: When I taught electricity and magnetism unit, I needed to create little bags of materials that students could test for conductors and insulators. I had parents cut paper, pieces of tin foil, cut wood, and package loose change, cotton balls, toys and other items for the bags. I also had parents cut wires and strip the ends of each wire for me. Each job was in a large ziplock back with all of the materials (scissors, bags, wire, wire strippers etc.) needed to complete the job as well as directions for what I wanted and a sample if possible. The parents were happy to do this simple job while watching TV at night etc. and it helped me out tremendously in reducing the amount of time I spent preparing for the unit. I could focus my time on what I’m a professional at – designing high-quality and engaging lessons for students! We all have a million things to do in a day – whatever can be delegated, should be – but it requires planning ahead. 5. Use your Systems – Keep it All Organized: The plus side of planning ahead is working smarter, not harder, being less stressed, saving money and time and many other benefits! The one down side is that often you have a lot of balls in the air at once. You are planning ahead for something a month away while also making sure everything is set for tomorrow. So be sure to use your systems (discussed in last week’s post on Getting Organized) to keep everything organized and simplified for yourself. My tried and true system is still old-school file folders. For each big project, field trip etc. that I am doing for the year, I create a file folder. Inside, I place all of my sticky notes that I brainstormed of tasks that need to be done. I put a star on it if it is something I can delegate, and once it gets done, I remove it from the folder and place the finished product inside or in a labeled bin (like when I have materials packaged or made ahead). When it is time, I pull out the file and bin, and I have everything I need for the unit/trip/project etc. Make sure you check in on your files to ensure that you are getting those tasks done. Whatever the system is that you use, it should work for your personal style! Don’t be afraid to change up your systems and try new things! When stress rears it’s ugly head, reflect and think about if you can do something differently next time in order to be more prepared and less stressed when the event/project arrives. 6. Appreciate and Celebrate: Once the event/project is over, be sure to thank those that helped you. If you received a donation, grant, or volunteer help, be sure to send a thank you note and photo of the completed event (some grantors even ask for a report). People and companies that support you want to know how their donation of time or money helped students learn and grow. Do not skip this step! Forgetting (or not making time) to appreciate people is equivalent to asking them not to help you next time you ask. On that note, I have to say thank you to my parents for all of the support they have been over the years. From refurbishing classroom furniture, hanging bulletin boards, chaperoning field trips when parents cancelled, to cooking the Thanksgiving dinner turkey, cutting and laminating, and donating school supplies for my students – they went above and beyond for me and my students and I will always and forever be grateful for their love and encouragement. Sometimes as a teacher I felt like I was hiking a big mountain looking just at my next step. I made it to the top, but sometimes by staring just a couple of feet ahead of myself, I missed easier paths I could have taken. Let’s lift our gaze from “survival mode” looking just one step ahead. Let’s raise our eyes to the end-goal in mind and look up and out for ways to make our school year journey a little easier!